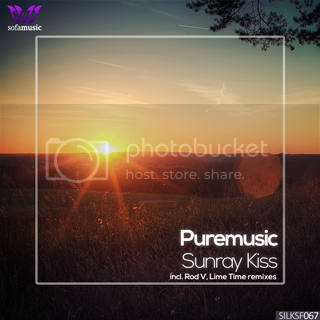 Following Puremusic's recent artist album "Purity" on Silk Sofa, we're proud to present the single release of "Sunray Kiss" from the album. It features remixes by two well-known label residents: Rod V (Guatemala) and Lime Time (Russia). The Original Mix starts off with a blissful atmosphere, including a mesmerizing lead theme and soothing pad layers. The breakbeat brilliantly contributes to the calm soundscape, and an array of beautifully crafted melodies dominates the song throughout its entirety. Following his "Sueños De Color" EP on Silk Sofa, Rod V returns with his interpretation of "Sunray Kiss". An intriguingly haunting atmosphere is quickly established, including soothing background synths and an enjoyable, growling bassline. Later, additional well-crafted melodies are added, including an interesting variation on the theme melody from the Original Mix. Lime Time is a busy man at the moment, but his work remains consistently strong. A tranquil background arpeggio line, as well as a soothing breakbeat, introduce the track, and later, a great flute-inspired motif enters the mix. The theme melody is a quite energetic synth riff, which happens to go extremely well with the remaining elements.